Simon Farr at the Macdonald Aviemore resort. Leading international hotel operator Macdonald Hotels & Resorts has announced the addition of a key member of staff to oversee its portfolio in the North of Scotland. Simon Farr has been appointed to the role of CEO of the Macdonald Aviemore Resort and has also been named as managing director of the company’s Aberdeen and Inverness region. In addition to his responsibilities in the Aviemore Resort, nearby Spey Valley Golf & Country Club, Lochanhully Woodland Club at Carrbridge and Loch Rannoch in Perthshire, Mr Farr will also be responsible for Macdonald Norwood Hall (Aberdeen), Macdonald Pittodrie House (Aberdeenshire) and Macdonald Drumossie (Inverness). Mr Farr brings to the region a wealth of experience in senior management roles within the hospitality industry, including De Vere, Jarvis, Thistle Hotels andAccorHotels. During a career spanning three decades, Mr Farr has worked in some of the country’s leading venues including the Regent’s Palace Hotel in London and Wokefield Park in Berkshire. His experience also extends to the international hospitality industry having previously worked as Operations Director for Thistle Hotels in the UK and Asia. The flagship Macdonald Aviemore Resort employs 248 people, including seasonal staff, and has recently been the focus of a major programme of investment to mark this year’s half centenary landmark anniversary. 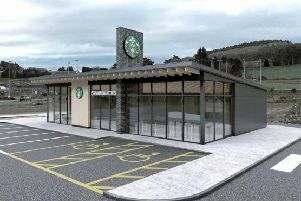 The multimillion pound project has included a new indoor children’s play centre, a new clubhouse for the Spey Valley golf course and significant investment to lift the Macdonald Morlich and Macdonald Aviemore hotels from three to four-star status in 2015. In addition has been the creation of three dining destinations within the resort with the creation of the new Spey Burger restaurant and refurbishment of the popular Giovanni’s Italian Ristorante to sit alongside the Scottish Steakhouse. Commenting on his new position, Mr Farr said: “I am delighted to join the team during the Macdonald Aviemore Resort’s important half centenary year and I look forward to bringing further value to the company’s properties in region as a whole as well as enhancing the visitor experience to create a culture of return stays across the region. “I have completely fallen in love with Scotland since my arrival and I am excited to relocate here.